With an incredibly diverse range of cultures and cuisines, New York has something to offer everyone–even if you don’t have a ton of money to spend. Whether you’re in the Big Apple for an internship or you’re a lifelong native like me, you (and your wallet) are sure to love these restaurants! 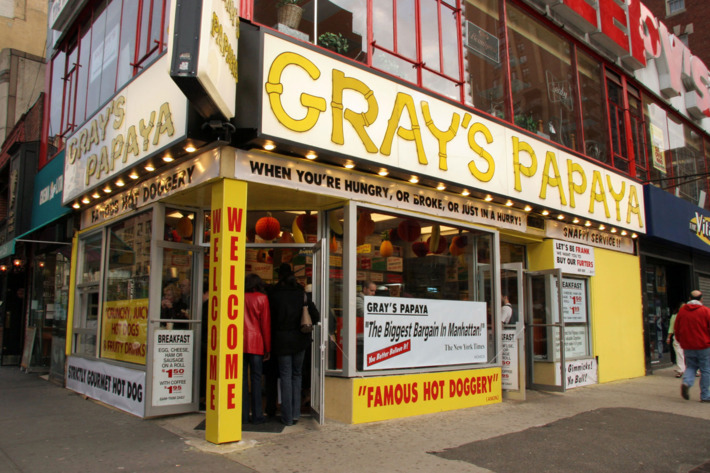 You can’t get much cheaper than $2 hot dogs, which is what Gray’s Papaya is known for. Although the setting–a tiny corner restaurant with no seats and chaotic counter service–is somewhat lackluster, the hot dogs are a top-notch New York staple (even better than Nathan’s, in my opinion). They also serve refreshing (virgin) tropical drinks, such as banana daiquiris, papaya juice, and my favorite, the pina colada. If you’re looking for a quick bite and a cold summer drink, this is the place to go. As a huge ramen fan, I’ve tried my fair share of NYC noodles, but my favorite has always been Terakawa Ramen. With only about 10 seats around its intimate U-shaped bar, this popular ramen shop fills up quickly with customers craving delicious (and cheap!) Japanese fare. Hundreds of favorable reviews praise the shop’s flavorful broth and tender pork slices, as well as their speedy service. My favorite dish, the classic Terakawa Ramen, only costs $10.50 - a total steal, and super filling. This small Puerto-Rican restaurant in Spanish Harlem is known for its cuchifritos, fried foods (usually including pork) found in both Spanish and Puerto Rican cuisine. With a window full of various fried foods to choose from, like crispy meat-filled alcapurrias and tangy chicharon, you can get a delicious meal for under $10. Due to the fast service and limited seating, this restaurant is great for on-the-go take-out dining. As you can probably guess from its name, this tiny, bustling Chinese restaurant serves tasty hand-pulled noodles in soups and stir-fries. With a range of noodle sizes and styles to choose from, you can really customize your order, and most dishes cost only about $5-7. My favorite, the Fujianese Wonton Noodle Soup with the #4 noodles (thick and flat style), is full of mouth-watering broth and pork-stuffed wontons. And if you peek in the back, you can actually see the staff hand-pulling the noodles! Last but not least...if you’re a New Yorker, you’ve probably eaten at several of the city’s many 2 Bros Pizza locations. Known for its classic $1 cheese slice and late hours, this chain is the best place to go a for post night-out snack with friends. 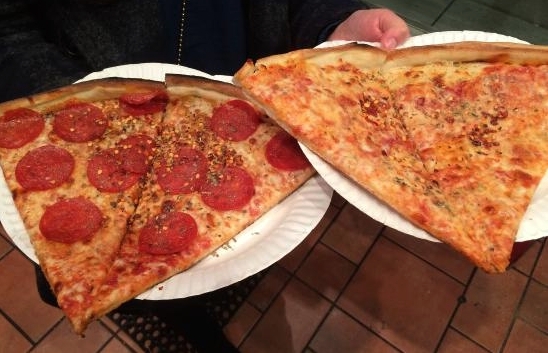 It’s certainly not the best pizza NYC has to offer, but if you’re strapped for cash and craving a standard-quality slice, 2 Bros is the perfect option.